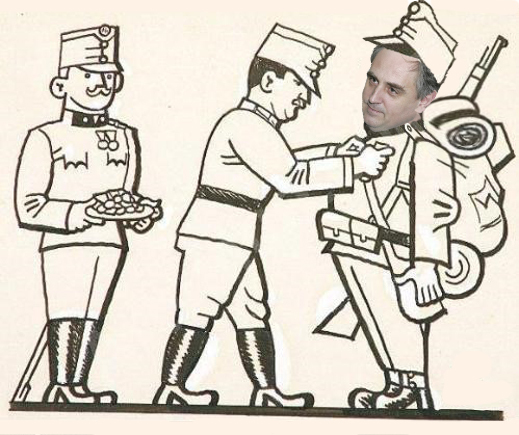 Edward Lucas has revealed that he is virtually leaving the UK for Estonia. His wife, Cristina Odone, too. That may be strategic, because they think they should be closer to the front line in the war against Russia. It may be personal, because they want to be closer to their family friends, ex-foreign minister Radoslaw Sikorski and Anne Applebaum, his wife, who have suffered from recent scandal and misfortune in nearby Poland. When asked to explain in an interview with Estonian state television in Tallinn on Monday, Lucas said he wants to take advantage of Estonia’s tax system. A Russian invasion notwithstanding, about which Lucas has done much broadcasting, he thinks the risk is outweighed by the benefits of Estonia’s zero tax rates for company income, dividends, interest payments, and copyright royalties. According to Estonian state television, on Monday the President of Estonia, Toomas Hendrik Ilves, made a presentation to Lucas, conferring on him the award of “1st E-Resident human in the world”. The ceremony can be followed here, with Ilves presenting in English, and Lucas responding. Lucas has already been on the receiving end of medals on account of his long connexion with Lithuania, Poland, and the Baltic Assembly – a tri-government entity of Latvia, Lithuania and Estonia. In Tallinn he was denigrating those medals so that they wouldn’t leave a stain on his reputation. Recently he claimed: “as a journalist writing about the region I shouldn’t receive awards from governments.” The file on Lucas, his medals, and his relationship with the Polish Foreign Ministry can be read here. In Washington this week Lucas has also published an objection in Johnson’s Russia List saying it’s “unfair and untrue” that his Polish award “slanted” his coverage of the country.